We are glad you’d like to learn a little more about Union Church. We hope to see you soon at our worship service, but until then, here is some information that will help you plan your visit! We are a group of people that share one thing in common: we have been transformed by the grace of God through Jesus. Not one of us is perfect, but we all love, trust, worship, and follow the Perfect One, Jesus Christ. So, if you don’t have it all together and are in need, you should feel right at home with us. We meet for worship every Sunday morning from 10a to 11:30a. Feel free to come by early to connect further with others over some coffee and bagels. In our worship gatherings we come to honor and enjoy God through singing, praying, preaching from the Bible, taking communion, and relationship with others. Sundays are times we come to satisfy our hungry souls in Jesus. 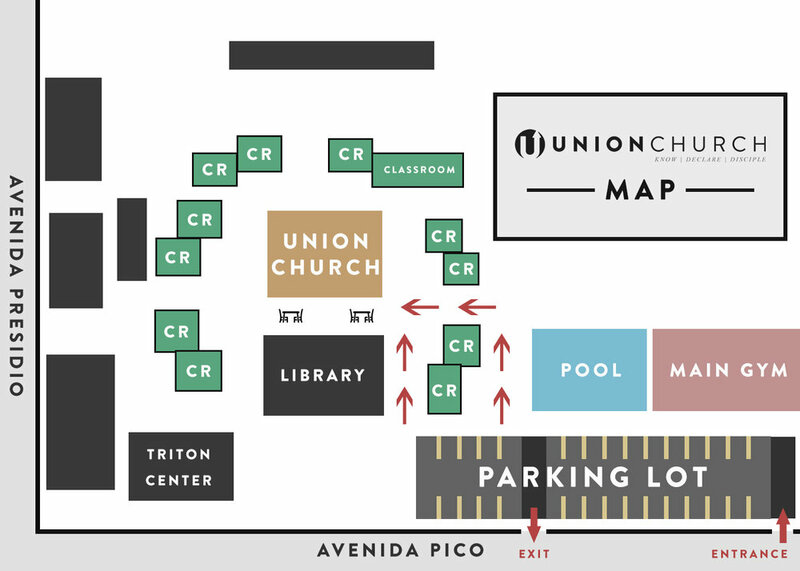 After entering the High School parking lot from Pico, take a left and go straight until you see the Union Church signs and large welcome flags at the far end. Park anywhere near the signs. Once parked, continue following the signs and they will direct you straight to the Little Theater which is where we meet for worship. You also will be greeted by one of our members who will be near the parking lot to answer any questions and point you in the right direction. Once you get to the Little Theater, our greeters will gladly show you where your little ones will be cared for during service. Children (from 6 months to 5th grade) will meet in nearby classrooms and will enjoy a time of playing, crafts, singing, and foundational teaching from the Bible about who God is and what He has done for us through Jesus! Our Volunteers: Each volunteer is required to be trained and screened, and we maintain strict teacher-to-child ratios to ensure safe care. For health standards, children must be free from fever or symptoms of contagious disease for 24 hours. Let us know of any allergies or medical conditions your child may have. After the service, the church is encouraged to stick around to enjoy refreshments and relationships. This is a great time to get to know us and allow us to get to know you!